For Bernie's Red, a public service post! Even when markets are headed south, a 401(k) is a great vehicle for retirement savings. Answer: Let me see, how do I say this to get across just how strongly I feel about this answer? How about: Definitely. No question. Positively. Absolutely. Without a doubt. Or, to put it another way: Yes. I can understand why you might feel anxious about contributing to your 401(k) account at a time when the national mood is so gloomy. It’s hard not to let the travails of the moment color your long-term planning. But the fact is, when you invest money in your 401(k), improving your retirement prospects over the long-term should be your focus. When you’re contributing to your 401(k) early in your career - say, when you’re in your 20s or 30s - you know that this money is going to be invested at least another 20 to 40 years. So as long as you’re investing in a diversified mix of stock and bond funds, it doesn’t make much sense to get caught up in the short-term ups and downs of the market. If you’re on the verge of retirement, then clearly you’ve got to give more consideration to what might happen to the value of your account over the next few years. You don’t want to see your 401(k)’s value decimated by market setbacks on the eve of retirement. But even then the answer isn’t to stop contributing. Indeed, the money you invest in the last few years before you call it a career may very well turn out to be the funds that will sustain you in the later stages of a retirement that could last 30 or more years. Rather, the way to protect your nest egg as you approach retirement is to gradually shift more of your 401(k) portfolio from stocks to bonds. I realize, however, that concern about the short-term can often blind us to long-term considerations. So I’d like to offer three more immediate reasons why you shouldn’t abandon your 401(k) now. You’ll be giving up a tax break, and possibly free money. One of the nice little advantages of participating in a 401(k) is that you get to invest pre-tax dollars, which lowers your current tax bill. What’s more, the investment gains on your contributions - as well as the gains on your gains - grow without the drag of taxes. Yes, you do eventually pay tax on this money at withdrawal. But years of tax-deferred compounding allows you build a bigger nest egg than you could with taxable accounts alone, which in turn allows you to live a more comfy retirement. And if your 401(k) plan is among the majority that provides employer matching contributions - typically 50 cents for every dollar you contribute up to 6% of salary - then bowing out of your plan now is like giving up free money. Walking away from these and many other benefits of 401(k)s just makes no sense, even if the economic outlook at the moment appears tenuous. You may be foregoing attractive returns. There are no guarantees when it comes to the financial markets. But there’s a good chance that the money you invest in your 401(k) when the markets are struggling will give you some of the highest returns you’ll earn over the long run. This is a somewhat counterintuitive concept. People tend to feel most comfortable about investing after the markets have been on a roll and have racked up big gains. But the exuberance that naturally occurs during bull markets eventually leads investors to bid up share prices to blimpish levels. That diminishes the potential for future gains much the same way that overpaying for a house does. When things are looking more bleak and investors are wary, on the other hand, share prices are generally lower relative to companies’ long-term earnings power. That translates to a greater potential for higher long-term returns than when things are going swimmingly. I’m not suggesting that 401(k) investors should try to time their contributions to any particular market outlook. That would be foolish. But at times like today when pessimism is pervasive, it’s not a bad idea to remind yourself that the money you contribute when your fellow investors are most skittish often ends up racking up higher returns. You might not resume contributing if you stop now. Another nice advantage of contributing to a 401(k) is that it forces you to live a bit below your means. Your contribution comes out of your paycheck before you get your hands on it, so your spending naturally conforms to what’s left - that is, your income after you’ve allowed for saving. If you suspend your 401(k) contributions, however, you’ll be giving up this little psychological advantage. Your paycheck will be larger, thus freeing up more money for you to spend. Even if you plan on resuming your contributions when the economy improves, doing so may be more difficult than you think, especially after you’ve gotten used to having that extra money to throw around. It’s always harder to scale back your lifestyle than it is to ratchet it up. So I think there’s a real danger that what you intend as a temporary hiatus from your 401(k) could turn into a long-term absence that seriously impairs your retirement prospects. Bottom line: It’s challenge enough to create a retirement nest egg these days even if you contribute faithfully to your 401(k) throughout your career. Start moving in and out of your plan based on how you feel about the economy and that challenge could become a mission impossible. A brewer 21st Amendment Brewery in San Francisco shows a bucket of hop pellets. OAKLAND, California -- At Pacific Coast Brewing here, brewer Donald Gortemiller is reworking his recipes and altering his brewing styles like never before. Gortemiller isn't acting on a spurt of creativity. He's coping with a worldwide shortage of hops -- the spice of beer. The dry cones of a particular flowering vine, hops are what give your favorite brew its flavor and aroma. Prices of the commodity are skyrocketing as hop supplies have plummeted, forcing smaller brewmasters around the United States to begin quietly tweaking their recipes, in ways that are easily discerned by serious imbibers. The shortage -- caused by a dwindling number of hop growers worldwide, and exacerbated by a Yakima, Washington, warehouse fire -- has forced Gortemiller to use fewer and different hops than before, changing the flavor of his beer. He's also resorted to beer hacks, like "dry hopping," in which the hops are added late to the mix, consuming fewer hops and yielding a more consistent flavor. "When hops were $2 a pound, compared to $20 or $30 a pound now, it didn't matter. We'd throw them into the boil at various times," Gortemiller says. "That was an inaccurate way of doing things. We're modifying recipes and using about 20 percent less hops." Brewer Chuey Munkanta at the 21st Amendment Brewery pulls the grain out of the wash tun. The beer-brewing situation demonstrates how the global-commodity shortage is spilling over to affect diverse industries in unexpected ways. The hop shortage lives on the outer edges of a food crisis that's prompted riots across the planet, and last month led U.N. Secretary-General Ban-Ki Moon to implore the world's governments to increase food production to stave off a 40 percent jump in the cost of staples. While nobody in the craft-beer industry is going hungry, they are being forced to adapt. There's no replacement for hops in beer -- they give the brew its flavor. But other key ingredients are in short supply, as well. Malt, which comes from sprouted barley, produces the alcohol and body of beer -- its prices have doubled along with hops. The price of rice, used by industrial brewers, has charted a similar course. The larger commercial brewers are better off. Most have long-term contracts for hops, barley and rice, and are doing whatever is necessary not to tinker with their brand names. "Coors Banquet has been tweaked very little since it was introduced in the 1800s," says Molson Coors spokeswoman Jenny Volanakis. "We don't play around with our beers." NURBURG, Germany — Cadillac announced today that the 2009 Cadillac CTS-V has run a 7:59.32 lap of the Nürburgring Nordschleife in the hands of GM Performance Division's John Heinricy. This is thought to be the fastest-ever lap time for a production sedan on this demanding 73-corner, 12.9-mile racetrack. The redesigned CTS-V is no stranger to the Nordschleife, as it was here that spy photographers first spotted this car in heavy camouflage. The high-performance sedan is now in the final stages of development and testing, says Cadillac, and this particular CTS-V had no significant modifications over and above the production specification. Although not confirmed as the fastest lap any sedan has ever run on the Nürburgring, there's no denying the 2009 Cadillac CTS-V has the hardware to pull off such a feat. The power source in the CTS-V is GM's supercharged 6.2-liter LSA V8 and it's rated for an estimated 550 horsepower at 6,200 rpm and 550 pound-feet of torque. We'd guess this particular car also had the six-speed manual transmission, which will be offered as a hard-core alternative to the usual automatic. Cadillac says it will post video footage of the record-setting lap on the Cadillac Drivers' Blog in the coming days. How I got my hands on some marijuana -- the legal (and easy) way. Sometimes I can't believe how Californian California is. Women walk around half-naked, waiters call patrons "dude," and medical marijuana is legal. But I wondered just how legal. Could anyone buy it? Even me, who doesn't have cancer, AIDS, arthritis, glaucoma or even any previous pot-smoking experience? Medical marijuana isn't really legal -- in 2005, the Supreme Court said federal anti-drug laws trump state laws -- but California and 11 other hippie states have been flipping off Washington for years. Finding a medical marijuana distributor is shockingly easy, as Times columnist Sandy Banks noted in her recent columns on getting pot to treat arthritis. Sprinkled innocuously around L.A. County are more than 200 dispensaries that look like health food stores or pharmacies -- including three just at the intersection of Fairfax and Santa Monica. To shop at these places, though, you need a doctor's recommendation on an official form. Once you have that, no California cop can arrest you for holding up to eight ounces. That amount, I'm guessing, was based on conservative medical estimates of how much Snoop Dogg would need if he came down with glaucoma at the same time Animal Planet aired a "Meerkat Manor" marathon. I made an appointment at a medical office recommended by Shirley Halperin, the coauthor of the new book, "Pot Culture: The A-Z to Stoner Language & Life." Halperin chose our particular clinic less for its medical expertise than the fact that it shared a parking lot with a pot dispensary. Stoners are very clearheaded when it comes to avoiding extra effort. As I sat in the tiny waiting room, filling out my medical history and getting nervous, Halperin assured me that no one she knows had been rejected, which seemed convincing because the only people sitting near me were two healthy looking guys in their 20s. When I got called in, I entered a doctor's office different from any I'd ever been in. It contained only a tiny desk, two chairs, a small TV and two cans of Glade. Also, the doctor wore a Hawaiian shirt. He took my blood pressure and asked what I was suffering from. "Anxiety," I said. And then "occasional insomnia." And even though he seemed to be moving on, I blurted something about headaches. The only malady that would have made me more similar to every human being throughout history would have been "these painful little pieces of skin that peel up next to my fingernails." The doctor followed up on my insomnia, however, and asked if I was having work problems or relationship issues as he handed me a photocopy of a handwritten list of psychiatrists. He'd give me a recommendation for medical marijuana for six months, he said, and would extend it to one year if I saw a therapist. The whole thing took about four minutes. I paid the receptionist $80 -- cash only -- and she gave me a filled-out form that states I am under medical care and supervision for the treatment of a "medical problem." I felt touched that the doctor hadn't just written I was suffering from "stuff." At the dispensary, a Harley-riding bouncer checked my newly minted medical forms and driver's license and let us inside. The dispensary was like a really nice coffee shop, with paintings on the wall for sale, couches and a drum kit upstairs for live jazz. A pretty woman behind the counter -- kind of a pot sommelier -- brought out a huge menu, divided into sativa (uppers) and indica (the downers all dealers sell) varieties, with names such as Bluedot Popcorn, Hindu Skunk and Purple Urkel. Like a high-end tea shop, she used chopsticks to procure the buds from glass jars -- all organic and grown in California -- which she had me smell and look at under a microscope. I settled on a gram of Sugar Kush, which sounded appealing until I wondered what kind of breakfast cereal would cure Sugar Kush munchies. Honey Bunches of Fudge? Frosted Mini Frosted Minis? Count Plaqula? Next, I took the advice of a fellow patient and went to buy some "edibles" at the Farmacy. This is the most famous of the L.A. dispensaries, with three locations, only two of which are right next to a Whole Foods. The Westwood branch is a sleek health food store that also sells vitamins and lots of Goji berries, and, unlike at the doctor's office, all the salespeople wear white lab coats. As a first-timer, I got to spin a wheel to determine my free gift medicine, which was a pot-infused lollipop. I also bought a vegan chocolate-chip cookie medicine and a chocolate bar medicine, and deeply considered the gelato medicine. Wondering if I had an unusually easy time, I called High Times magazine's 2006 Stoner of the Year, Doug Benson, a comedian who just released "Super High Me," a documentary in which he stops smoking pot for 30 days and then, for his next month, is high every waking minute. As part of the documentary, he got his medical marijuana certificate. "I told my doctor I had a weak back. And when he said, 'How long?' I said, 'About a week back.' " He did not get rejected. As a patient or a comedian. In fact, Benson buys all his pot from a dispensary now. Even with the sales tax, he pays the same price and, he said, gets more consistent quality than he did from a dealer. "I had a dealer who came by my house, but this is more convenient," he said. When I asked him how that could be, he explained: "I used to have to sit there and listen to his stories. Because dealers like to hang out." I always wondered what would happen if marijuana were legalized for anyone over 18. It seems it already has been, and nothing happened. It's hard to resist the lure of the open road when summer rolls around — and with our editors' favorite scenic drives across the United States, you'll know exactly where to point your car this year. We've listed our favorites from west to east — including everything from the obvious Highway 1 in California to the less-obvious — but brilliantly named — Going-to-the-Sun Road in Montana. We've picked routes for their history (U.S. Route 1 in New England and Million Dollar Highway in Colorado); for their natural scenery (Blue Ridge Parkway, Red Rock Scenic Byway, Highway 12); for their romantic appeal (routes through Sonoma and Napa); and for their remote wild beauty (Hana and Seward highways). Best of all, most of these routes make for splendid drives all year long, so you can get out and explore their bounty whenever the mood strikes. So rev your engines ... and hit the road. Stretching some 469 miles along the Southern Appalachian Mountains and linking two eastern national parks — Virginia's Shenandoah National Park in Virginia and North Carolina's Great Smoky Mountains — the Blue Ridge Parkway has often been referred to as "America's Favorite Drive." It's certainly the country's first rural parkway — parts of it date back to 1930s (when construction began as a make-work project during the Depression) — and the longest, with breathtaking scenery and dozens of recreational opportunities to distract you when you need to stretch your legs. Though some may argue that autumn is the best season to drive this stretch, as the brilliant fall foliage is in full effect, May is also a superb time to head this way, to witness the profusion of wildflowers in bloom along the elevated mountainsides. Also included in this scenic route is the impressive Skyline Drive, a 105-mile swath of road that cuts through Shenandoah National Park. Of course, no nature drive of this sort would be quite complete without wildlife sightings: Keep an eye out for resident whitetail deer and black bears. It's no wonder the aloha 'aina (love of the land) spirit is the bedrock of Hawaiian tradition. A drive on Maui's beloved Hana Highway (also called "the road to Hana") offers such an awe-inspiring display of natural beauty that you'll soon revel in the same sentiment. This serpentine trek starts off in Paia, famous for its surfer-swept shores, and zigzags east along the coast for more than 50 miles, all the while embracing 600 hairpin curves, 54 one-lane bridges, and some of the island's most spectacular sights. Indeed, Keanae Arboretum (an exotic botanical garden), Waikani Falls (a trio of crashing chutes), Ka'eleku Caverns (an ancient cavern system created from a lava flow thousands of years ago), and Waianapanapa State Park (home to a famous black-sand beach and fresh-water caves) are all in close proximity. Your excursion will land you in the sleepy coastal village of Hana, where you can take up shack and relish the quiet countryside and local culture or, continue a tad further to Haleakala National Park where you can cool your jets in Oheo Gulch (aka the Seven Sacred Pools). Keep your windows down as you go and breathe in the sweet air infused with eucalyptus and ginger. To get the most out of the drive, pick up a "The Hana Road Self-Guided Drive" CD from the Shell gas station on Route 380 in Kahului; it narrates the journey and highlights all of the must-sees. California's State Route 1 (a.k.a. 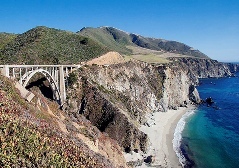 Highway 1) skirts the Golden State's glorious Pacific coastline from "So Cal," near San Luis Obispo northwest to the forests of Monterey. While the twists and curves, and occasional precariously-perched cliff-top road, may prove challenging at times (one section has been ominously dubbed Devil's Slide, thanks to landslides and erosion that have occasionally made the road impassable), the magnificent vistas of ocean waves breaking on rocky sea-sculpted shores, windswept beaches dotted by frolicking otters or sea lions, and magnificent forests presiding above it all can rouse even the wariest of drivers behind the wheel. Forays into charming little coastal towns, like Carmel-by-the-Sea and Laguna Beach, as well as into the trilogy of Californian cultural centers at Los Angeles, San Diego, and San Francisco, are met by attractions ranging from historic missions to magnificent mansions (don't miss San Simeon's mountaintop Hearst Castle). There are also endless opportunities for outdoor recreation, particularly around the Big Sur area, where you can hike through redwood forests, comb the beaches for shells and jade, and camp under the stars. Windswept red-rock canyons, towering sandstone formations, pristine lakes, and pine- studded mountain ranges combine for an altogether over-the-top sensory experience in Southern Utah. The setting for several stunning national parks, this remarkable road connects those at Bryce Canyon and Capitol Reef, and offers unique beauty and seemingly limitless recreational opportunities on a stretch of land between the two parks' boundaries. Utah Highway 12, also known as Highway 12 Scenic Byway, is one of only 27 nationally designated All-American Roads — the highest honor a road can get for attractive scenery. This spectacular route travels away from Bryce Canyon, through the Grand Staircase- Escalante National Monument, and over the forested Boulder Mountain and the Dixie National Forest, before winding down near the entrance to Capitol Reef. The scenery is unforgettable along the entire length of the road — especially during the brilliant red-rock sunsets that provide a glorious grand finale to a day's driving adventure here. This spectacular 52-mile drive is the best way to see the dramatic remnants and rugged path left by gargantuan glaciers in Montana's striking Glacier National Park. Only open from early-June to mid-October (or until first snowfall), the Going-to-the-Sun Road, aptly named for its ever-escalating sky-high stretch with switchbacks up and over the magnificent Continental Divide, traverses Glacier National Park from West Glacier to St. Mary and covers untapped wilderness, rugged mountains, glistening lakes, deep river gorges, glacial canyons, and the long Garden Wall. This sharp ridge forms the Continental Divide, the only place in the country where water flows to the Pacific, Gulf of Mexico, and Hudson Bay. The road offers multiple lookout points, among them the 6646-foot-high Logan Pass, which ranks as one of the Divide's most impressive vantage points, and Jackson Glacier Overlook, 2 miles beyond Siyeh Bend, where remnants of the mammoth ice formations that carved the park's harsh terrain and contoured its valleys can still be seen. Indeed, the many jaw-dropping views and hiking opportunities along the way will have you making frequent stops to get out and explore; a few backcountry lodges, chalets, and campgrounds are available too, should you decide to prolong your trip by spending the night. See More Best Scenic Drives in the U.S. Professor Rick Shine from the University of Sydney has been studying the biology of cane toads, and will reveal his new research May 7 at the Academy of Science's peak annual event Science at the Shine Dome. He says that controlling toads has been difficult as things that kill them will often kill frogs. Professor Shine and his team studied cane toads in Queensland that lagged behind the invasion front and found they were infected with a lungworm parasite which slows down adults and, in laboratory tests, kills around 30% of baby toads. It was originally thought cane toads left their parasites behind when they came to Australia and that the lungworm parasite came from Australian frogs. This ruled out using the parasite for toad control due to potential frog impacts. However, DNA sequencing by Professor Shine's team has shown the parasite species came from the Amazon and is genetically different to those found in Australian frogs. 'The toads have brought with them a parasite that kills them and that doesn't attack Australian frogs, so this is a phenomenal opportunity for biological control' he said. Professor Shine's team have also discovered pheromones used to communicate danger between toad tadpoles that have significant impacts on their size and survival. The 'alarm pheromones' are released into a pond when a tadpole is frightened or injured and warns other toad tadpoles to flee the area. The signal stresses the toad tadpoles so much that in field trials around half of them died before they became adult toads, and those that become adults were half the size they should've been. The pheromones were also found to be different to those of Australian frogs and didn't affect them. Using the lungworm parasite and the alarm pheromone together would be particularly powerful as the pheromone either kills or produces smaller 'toadlets', and the parasite is more effective at killing these smaller sized toads. Attractant pheromones have also been found by his team which can be used to lure toad tadpoles for catching and removal. Professor Shine hopes to involve community groups in the use of these new control methods. He says that although there has been a huge effort to slow the toad front by communities in Western Australia and the Northern Territory, the toad front is progressing as fast as ever. Previous methods for controlling cane toad numbers have included traps and fences but have mainly involved physically removing them from the environment, often by putting them in a plastic bag in the freezer. 'People have spent certainly well over $15 million on cane toads in Australia on research and control. Very little of that has actually been devoted to try to understand what toads are doing. Now that we've done that, it does seem that there are really encouraging avenues. 'By doing the detailed ecology and actually finding out about communication systems and where the parasite came from and things like this, we've got new ways to attack toads that haven't been thought of before'. Science at the Shine Dome is the Academy's annual celebration of science and runs from 7–9 May 2008 at the Shine Dome in Canberra. Adapted from materials provided by Australian Academy of Science. A White Plains, NY woman who was the victim of burglary, including her MacBook, used the Back To My Mac screen sharing feature to turn on her webcam and capture images of the unwitting culprits using the computer. As a result, police were able to arrest the thieves and recover most of the stolen goods, which included two laptops, two flat-screen televisions, two iPods, gaming consoles, DVDs and computer games.